by Rob George. Oxford, England and Portland, Oregon: Hart Publishing, 2012. 178pp. Paper $36. ISBN: 9781849462549. Rob George offers a thought-provoking volume with the goal of stimulating consideration of the purpose, philosophy and practice of family law. He considers the rights, responsibilities, and interactions of parents and children, as well as the concepts of fairness and the welfare of the child principle. George is a British Academy Postdoctoral Research Fellow at University College, Oxford. His research focuses on family law with an emphasis on parent and child relocation and international and comparative family law. This volume is an out-growth of George’s law seminars in Oxford which draw the interest of both legal scholars and social scientists. The organization of this book is easy to follow. Each chapter flows smoothly into the next and the introductory questions and chapter conclusions help the reader to focus. Mr. George uses multiple cases and citations to back up his views, drawing primarily upon English law and court decisions, with some comparison to court decisions in other nations in the British Commonwealth and minimal references to decisions and statutes in the United States. George’s primary focus, as the title suggests, is to inspire the reader to question the route that family law is following. He leads us through a summarized history of family law and the response of family law to changes in society over time. Students in the British Commonwealth, European Union, or the United States need, at a minimum, knowledge of the practice and philosophy of family law as it is interpreted in their own courts before going on to look at the issues which George raises. In addition, readers need a basic understanding of law in England and Wales, terms such as barrister and solicitor, English legal aid, and the organization of the English court system, which George briefly describes. Therefore, this book seems to be most valuable for an advanced seminar for undergraduate or graduate students who have obtained enough competence in family law to respond critically to George’s issues, especially those students with an interest in international and comparative family law and its diversity, a growing priority in this time of family mobility. 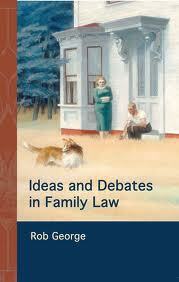 Ideas and Debates in Family Law is broken into three broad sections. The first discusses the theme, recurring throughout the book, of family justice, along with the role of rights and responsibilities in family law and the increasing importance of international and comparative family law. The second section deals with the legal guidelines regulating adult relationships, the meaning of these relationships, and financial fairness. The third and final section deals with family law as it relates [*48] to the welfare of children, parental responsibility and disputes over children’s residence. George notes that most of the issues he raises have neither concrete nor generally accepted answers. In fact, in his introduction he states that his goal is to raise questions, not provide answers. In some instances, he describes situations which appear to beg for more sensitive or knowledgeable statutes or court decisions. George urges his readers to consider expectations, responsibilities and rights within parental roles. While a parent may have a right to take an action, such as changing residential location, he asks the reader to consider whether that is the most responsible action for the parent. The diversity of family law among nations, especially as regards parental rights and child relocation, is a major issue in this volume. George suggests that the significance of this topic will grow in importance and complexity in the years ahead. He urges the reader to consider whether the internationalization of family law requires greater attention. Several chapters are devoted to consideration of the meaning of marriage, both legally and socially. While George uses the term marriage to include both marriage and civil partnership, not all readers may agree with this decision. His discussion of the reasons people choose to marry or cohabit without legal ties could be used to stimulate discussion, especially in light of the social and legal implications of marriage. Financial fairness is a major issue in the dissolution of marriage and/or co-habitation. George discusses the wide-ranging concepts which must be considered, including the meaning of fairness and whether or not using a standard of fairness is helpful. Should statutes be more specific or should court decisions and case by case analysis predominate? Are fixed or flexible rules more fair? How do need, compensation and sharing enter into the negotiations between the parties? If marriage is a legal contract, are pre-nuptial agreements enforceable or fair? Finally, George addresses the welfare principle, that the best interests of the child should be the predominant consideration in court decisions. He prompts the reader to consider the needs of others, especially the parents, and questions whether the child’s needs can be met if parental needs are ignored. He effectively demonstrates that different jurists may make very different decisions when considering identical situations. Throughout Ideas and Debates in Family Law, Rob George raises [*49] important issues for students interested in family policy, the practice of family law, and governmental investment and involvement in justice for families. Faculty considering this volume for class use should carefully consider whether it meets the needs of their current students and course outlines. For appropriate students and seminars, especially those involving international and comparative family law, George raises significant issues of local and international import and offers the opportunity for stimulating discussion and research. Copyright 2013 by the author, Rosalie Young.